We decided instead though to put the effort it would take to put on a party into a cause. So we chose the Tree of Hope Foundation. 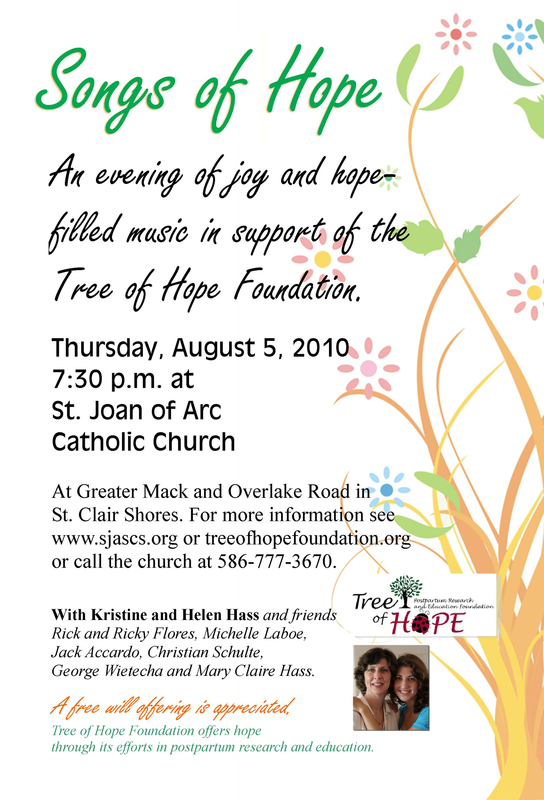 We’re holding a concert Songs of Hope at St. Joan of Arc at 7:30 on Aug. 5. We have some really talented folks with us. It’ll be cool. We’re singing mostly contemporary Christian music. All songs with hope at the theme. 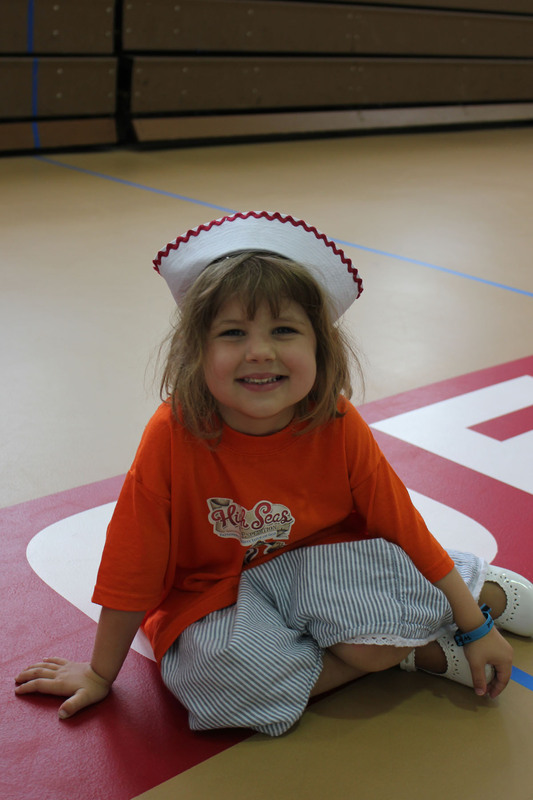 The Tree of Hope Foundation was conceived as a result of a tragedy. In 2005, a young mother in our parish took her own life and that of her five-week-old infant daughter as a result of a postpartum mood disorder. On the day of that tragic event, her family vowed they would do what they could to prevent that from happening again. They began the Tree of Hope Foundation which promotes research, education and awareness of postpartum-related mood disorders. Check out their site to learn more of the good work they are doing. A few years ago, I was asked to sing at a prayer service for the foundation. When I arrived, the pianist asked if I had a suggestion for any songs, and I suggested one called O God You Search Me and You Know Me, based on Psalm 139 with music by Bernadette Farrell. It was fairly new to me but spoke so plainly of God’s providence. As it turned out, that particular prayer was the central prayer of the service. And I didn’t know in advance. And it just seemed so … well … providential. I was very moved by the service and have been moved by all the work the foundation is doing. This is a way for our family to support their good work in the best way we can. We can’t run marathons and such. But Helen and I can sing. So, there it is. So if you can come on the 5th, please do so. So that’s what I’ll do. I’ll blame nature. I hate freaking out. But it happens. Although I like to stay sane, every now and then, that thing called frustration just reaches blood-boiling point, and I’m sorry to admit, I loose it. Yesterday started out fine. Left the kids with The Lists, and took Henry to a swim meet. When I got home, many things on The Lists were yet to be completed. And, I should note, The Lists were neither out of the ordinary, nor were they long. They were our regular Saturday-morning lists. The same old Saturday-morning lists that, for the past few months, my capable children have pretty much been blowing off. I take some blame for that. I had stopped being so diligent with actually creating the lists, instead just dictating. Therefore the directions were often lost. To the wind, so they say. But why print them? I would ask. They are the same every week. But here’s a little known fact: Apparently, some children (namely those who reside in my household) can’t accomplish certain tasks unless those tasks are formally instructed to them on a piece of paper, in full color. In the form of The Lists. And even then, especially recently, completion of said certain tasks can still be illusive. Fleeting. Mysteriously scarce. So, I blame myself. My bad parenting. I haven’t taught my children to follow through. I say to myself. I haven’t given them the skills they need to succeed in daily life. I shake my head. Or I, you know, on occasion, freak out. One child suggests I make a whiteboard for the lists. That would help. What is the difference? I inquire. Because that’s how so-and-so’s mother does it, and their house is in order. That way, we will always see what needs to be done, the child challenges. I explain that wouldn’t help. Then I would just have a posted reminder of all the chores around the house that didn’t get done. And that would just perpetuate that lack of cooperation in the house was acceptable. So acceptable that it is displayed on a wall. At least I can throw the undone paper list away, for a moment pretend it didn’t exist, and hope for better results when I print it again (slightly modified) the next weekend. Then I think: Wait a minute. Maybe my freak out today can be like The Lists. Maybe I can hope for better results for myself next weekend. And I can, for the time being, pretend that I never actually freaked out. I can, throw my freak out away, so to speak. I don’t have to have it staring at me on the whiteboard of my life. But then I thought, oh no, instead it will be festering or decomposing in a landfill or recycle center somewhere. Maybe I should reconsider the whiteboard. For the chore lists and myself. Maybe I should be reminded of what hasn’t been done so that I actively seek to do it. And then, when I have, legitimately wash it clean. After all, it’s not the whiteboard that keeps things in order, but using it to remind everyone what needs to be done or changed. So, there you are. Apparently, the tools are out there. We can shove our undone list in a landfill, but it’s still there. Still undone. Or we can post our failings for at least ourselves and God to see, and strive to change our ways. We can seek the opportunities (and the sacraments) that help wash us clean, realizing that soon enough we’ll have more to-dos on our whiteboards again. But because of God’s grace, we will live remembering what it was like when it was clean and (hopefully) seeking that peace and order again and again. This morning, when Lillian and I were looking at a book about the human body, she couldn’t wrap her mind around the picture of the heart. “That’s what my heart looks like?” I’m sure comparing it to what she knows as a heart shape. “Yes, and those are veins and arteries that carry your blood to and from your heart,” I explained.